Earlier in the week I had participated in a contest at my local running store, Runwell and ended up getting a new belt that holds all of your nutrition. It is called a FlipBelt. I decided to give it a shot race morning, despite never having run with it. In my first steps of running I immediately wished I had tried it out before hand. The first two miles the belt was bouncing all over the place and I was trying to figure out how to get everything out of my belt, pin my bib on my clothes all without losing any time. Eventually I adjusted my shirt enough underneath the belt that the bouncing stopped and it ended up being pretty useful. I’ll run with it again, but definitely needed some testing out before the race. 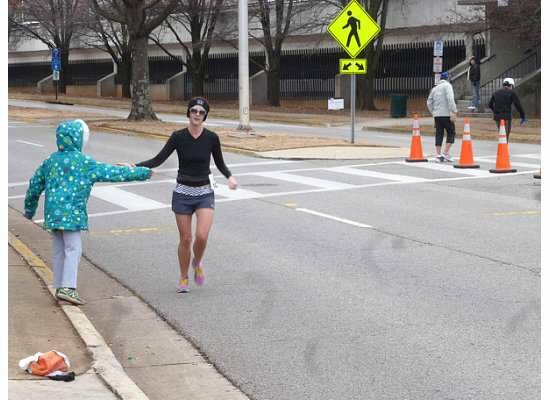 Mile 1, high fiving my family for the first time in the race. 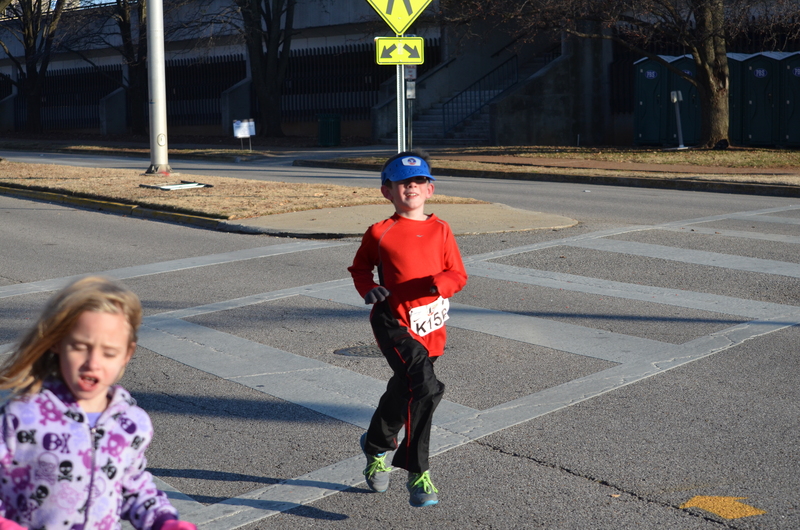 My kids participated in the Rocket City Kids Marathon. 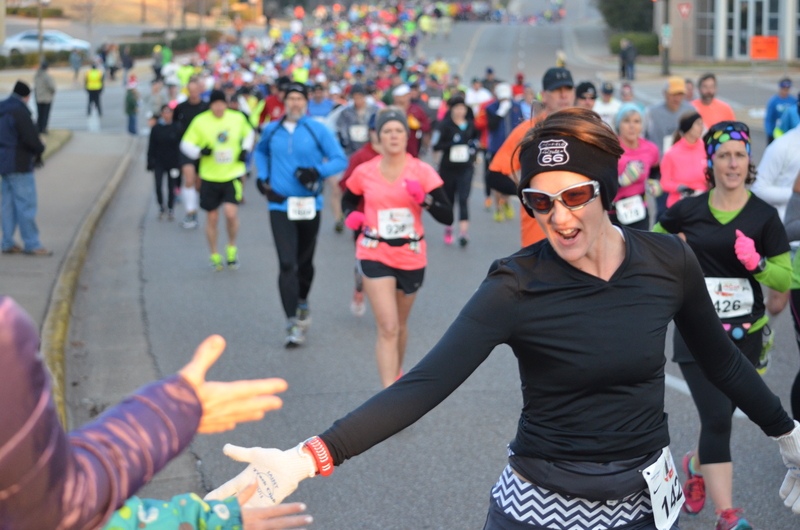 They ran 25.2 practice miles from September to race weekend. 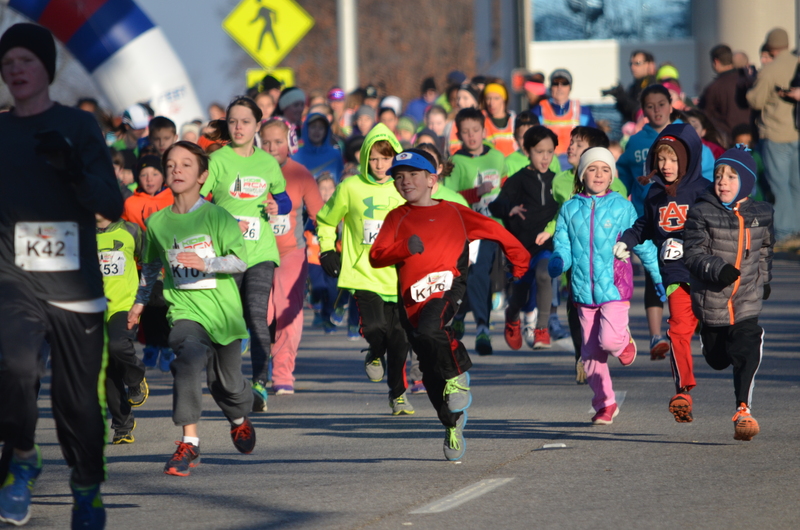 Then on Saturday, they ran their final mile as a race. 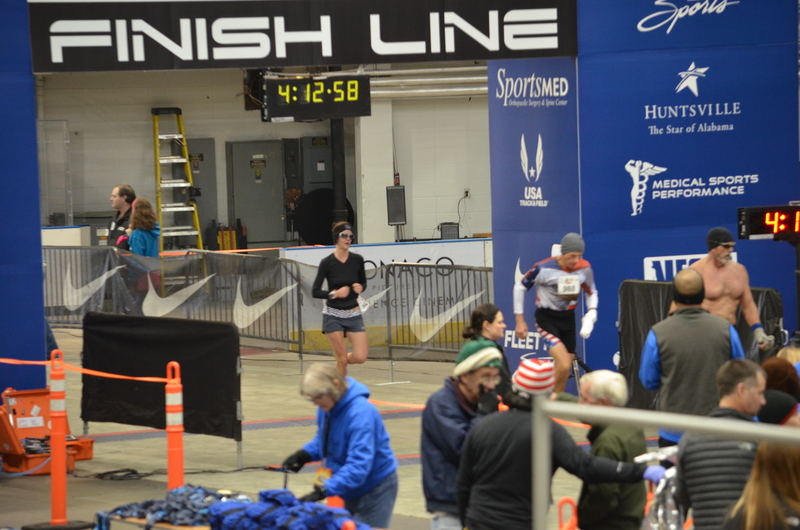 Their finish line was the same as mine, just a few hours before. My only complaint was that their race was during mine so I wasn’t able to see it. The pictures that my husband and parents took indicate that both did great and had fun. And even more fun, they both said PRs for their fastest mile! 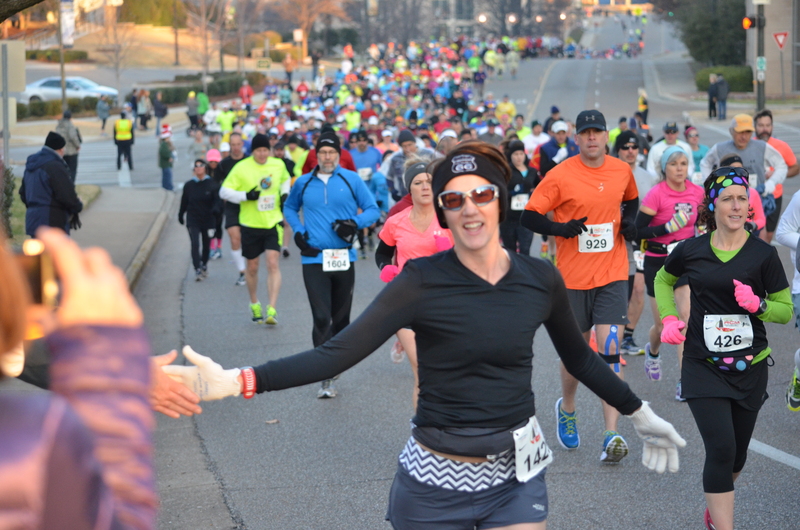 My plan was to run the first 6 miles of my race at about a 9:40 pace, then begin to pick up the pace slowly. For the most part it went pretty well. A few favorites from these miles: A sign that read “In Dog Miles You’re Almost Done”, and a spirit station in a neighborhood that was serving cold beer at about mile 7 or 8. There were cans of Pabst Blue Ribbon and a sign that read “Elite Aid Station”. I almost wished I wasn’t going for a time goal, not to stop to drink the PBR, but to take a picture of the sign. But I kept moving on. There was a porta potty at about mile 9 that I planned to stop at. 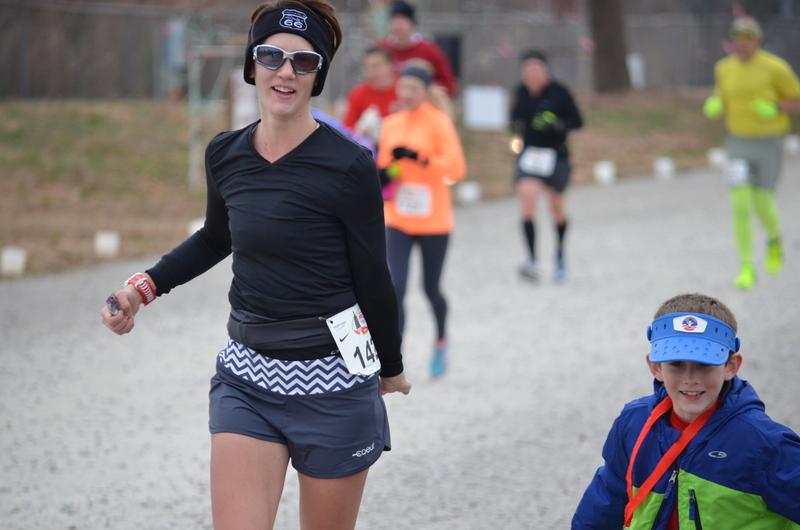 I spent most of that mile debating whether it was smart to push the pace to buy time for the wasted time at the porta potty or if I should just hold pace and make sure I had enough for the later miles. 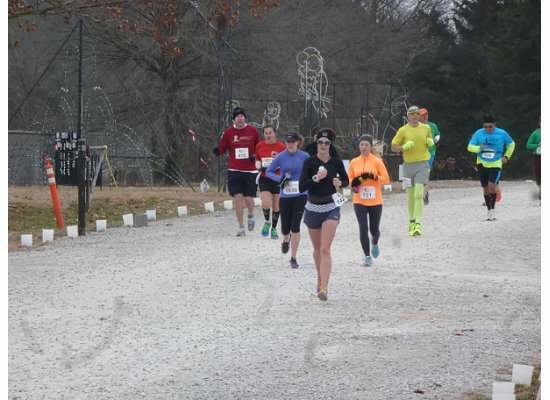 I ended up convincing myself that I could push the pace and anyone I passed, I would be getting to the porta-potty before them so I could be buying minutes with each person I passed, hahaha. When I got to the porta potty there was only one….There was one person in line ahead of me waiting. Although it seemed like an eternity, it wasn’t a horribly long stop and I continued on. When I first looked down at my watch after the stop it said my lap pace was 17:46. I tried to convince myself not to try to make up the time all at once. 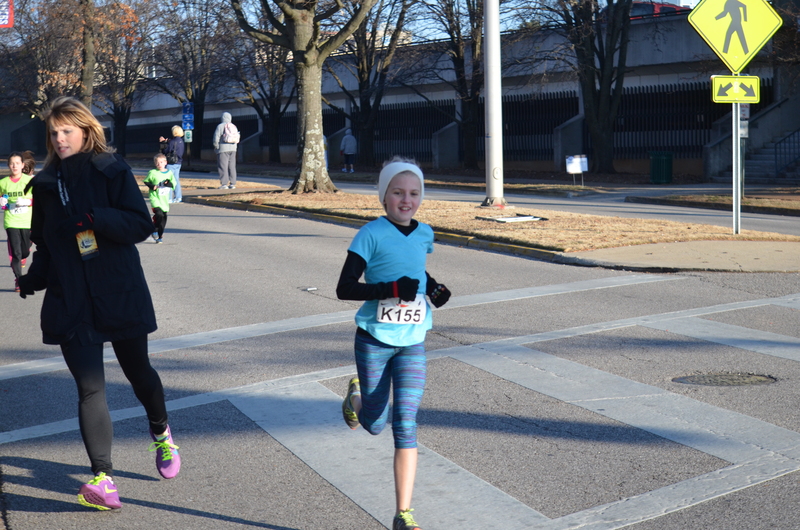 Smiling and feeling good at the 13 mile mark. My family did a really good job of navigating the course and were able to see me at mile 1, 13, 17, 20 and the finish. At each of those places, the kids were ready to give high fives and I certainly wasn’t going to miss that. The miles in between 17 and 20 were my favorite. We got to run through the Space and Rocket Center, under and around rockets, then through the Botanical Gardens. Lots of scenery and I was continuing to feel great. At this point I began to notice quite a few people walking, especially on hills and realized I was still feeling pretty good. I tried to keep the mile splits pretty consistent, continue on with my nutrition and keep hanging on to what I had done so far. 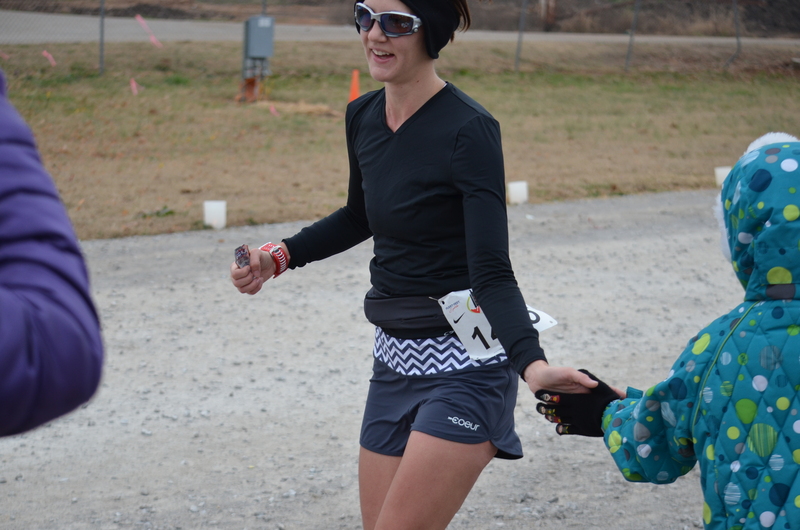 A number of spectators were commenting that I looked strong, looked like I was having fun, etc. I really debated whether or not I could make it to the finish without a second porta potty stop, but kept imagining myself exploding at mile 26 or something. When I spotted a porta potty at mile 23 with no one there, I decided a quick stop would allow me to focus on holding the pace study for the rest of the race. I began to struggle after the stop and just felt tired. Looking back I’m not sure if I needed another gel or just wouldn’t have stopped. The spirit stations in these miles were really great and definitely kept me going. Kept working my way through the miles and still was passing everyone. I’m pretty sure that no one passed me from mile 17 on. I’m pretty happy with that. Saw my family again at mile 26, knew I was finishing out a great race. 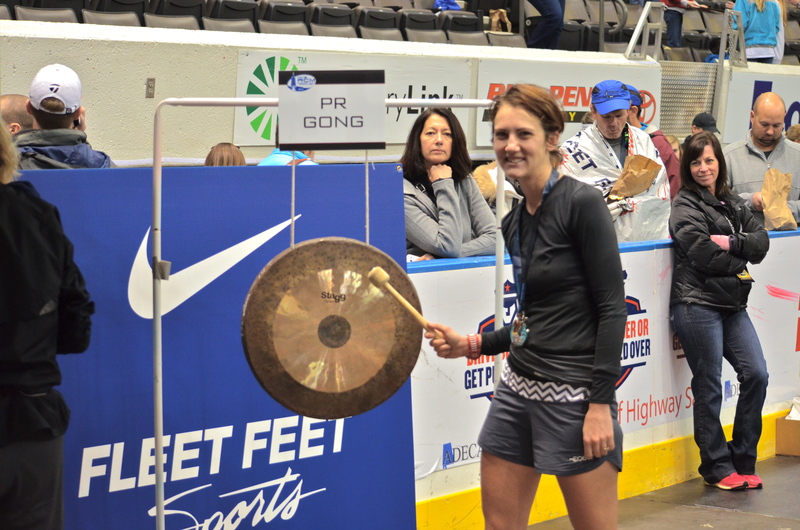 Heck yeah I rang the PR Gong! Training: B. 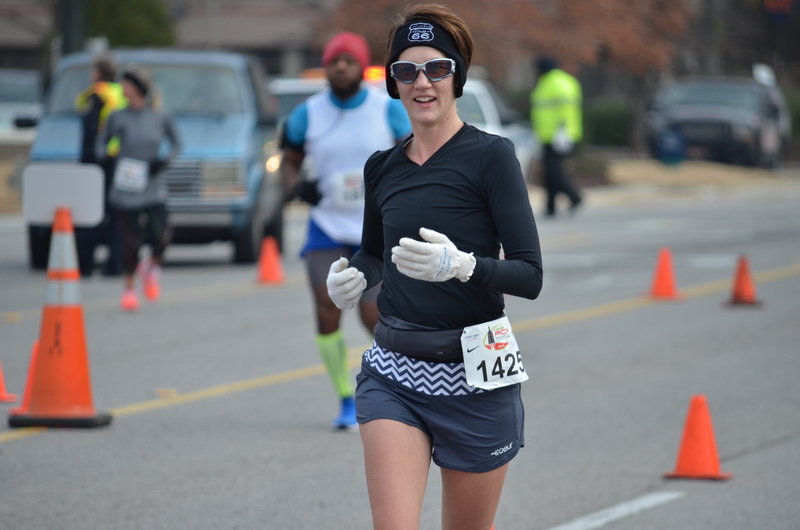 While my long runs were good and I think really helped me to have a much better race experience than my past marathons, I did not keep up with what I needed to do during the week. Next time around I want to include a track workout and tempo each week. 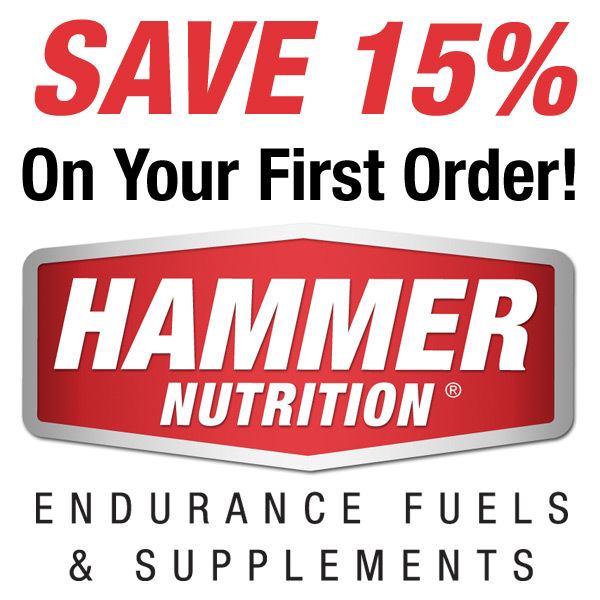 Nutrition: A. Really happy with how this aspect of my race went. Gel or chews every 45 minutes is my magic formula. Race course: A+. I was pretty nervous about the elevation gain advertised on this course as I live in a pretty flat area. I was pleasantly surprised that the hills were not an issue for me at all. None seemed too tough, but it was enough to keep the course from being boring. Lots of cool neighborhoods, the Space and Rocket Center, Botanical Gardens, and the fact that my family could get around enough to see me so many times. Race support: A+. I’ve never done such a well run race of any distance. This race thought of everything. Course marshals at every intersection directing traffic, residents out in their yards cheering for you, playing music. Bands along the course. A spirit station at least every mile. I can’t think of a single thing I would change. Race performance: A-. I’ve never not blown up in a marathon so was scared to push the pace. Next time I will be a bit more aggressive with my pacing plan. I didn’t finish feeling like I left a ton out there, but I think I could have done a bit more. 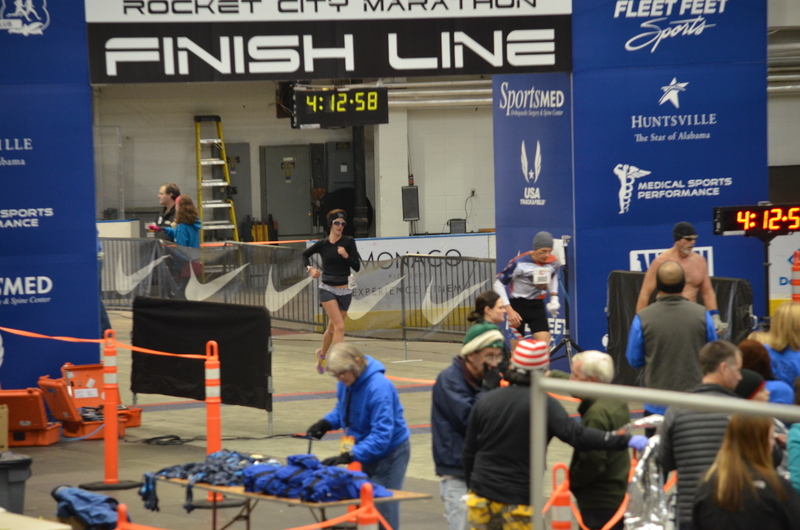 Still, a 30 minute PR is a pretty great way to close out my 2014 racing! For runners, streaking means you run at least a mile per day for a period of time. In April I did this and it really helped me to find my love of running again. Most of my runs that month were short in distance and without my watch. I have plenty of familiar routes around my house so I knew the distance already and just ran for feel. On Thanksgiving morning I was wasting time on Twitter and saw a number of tweets about the Runner’s World Run Streak. 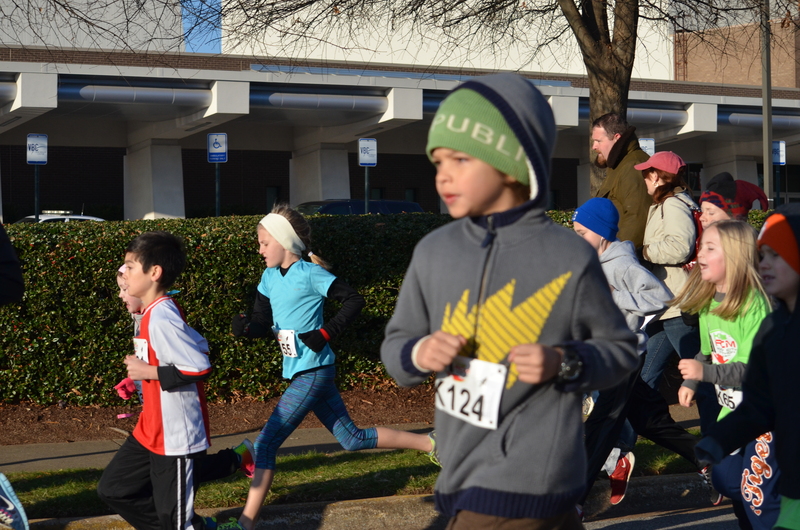 The basic idea is that you run each day from Thanksgiving to New Year’s. Since my family and I were doing the Gobble Hobble on Thanksgiving and I already had plans to run on the following Friday, Saturday and Sunday, I decided to join in. Although my long runs of marathon training have gone really well, I definitely feel I’ve fallen short on my mid-week training. Even short runs done on a regular basis will help with muscle memory and hopefully help to get me ready for my marathon in a few weeks. Before even hitting the first week, however, I’m really testing my motivation. I always struggle with finding balance between family life, work and my own individual interests. I want to set the example for my kids and expose them to an active lifestyle, but I never want them to look back and think that I missed things with them because of my training. Wednesday was a busy day. It meant PLC meetings after school (teacher speak for a weekly department meeting). Once I got home it was time to supervise my kids’ homework. My 6th grader asked me to check her math homework, which is no longer a fast process. In order to check it I had to sit down and learn how to do it myself! After homework was dinner, followed by putting up the Christmas tree and decorations with my family. Bedtime traditions here are 30 minutes of individual reading followed by me going upstairs to say prayers. My plan was to run as soon as prayers were finished. 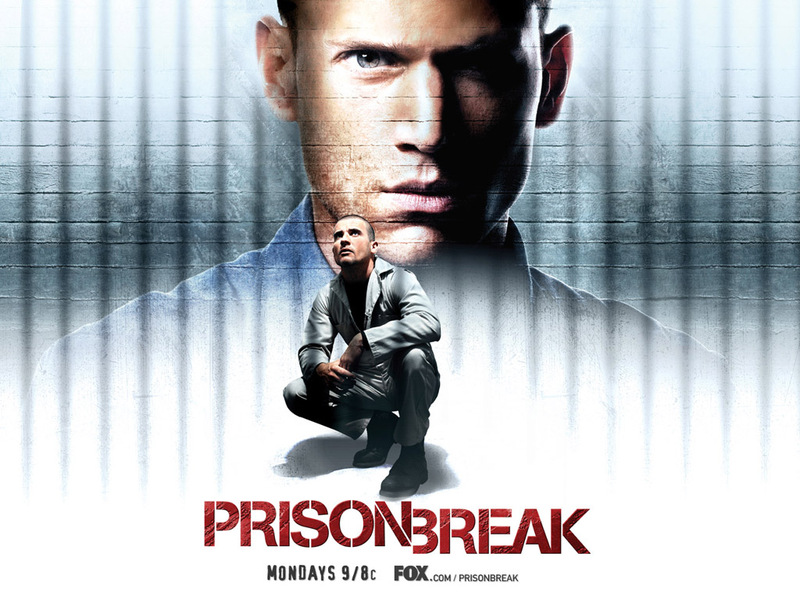 Then my husband started watching Prison Break on Netflix. We watched the whole series a couple years ago and it is highly addicting. Next thing you know, I’m hooked on a second episode and comfy on the couch in a blanket. I ended up falling asleep on the couch. At 11:25 P.M. 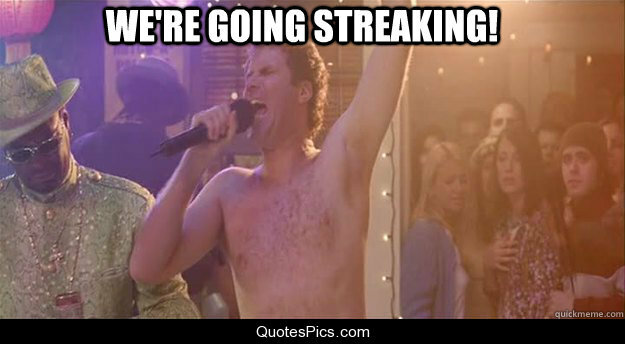 I woke up, realizing I hadn’t yet ruined my new streak. I bundled up and got in an easy 1.35 mile run and it felt great. Although the pace wasn’t extraordinary and the distance was nothing exciting, I felt proud that I still got the run in. Knowing that the rest of the month will be filled with lots of kid activities, end of the semester grading and planning at school and time to enjoy the season, I decided on my run tonight that I have to make my runs happen in the morning, before school, activities and family time. Most of the runs will be less than 3 miles and most will be at an easy pace, but I think the end of the month will have me stronger, create a sense of accomplishment and hopefully a habit of exercise even during the week when things get crazy. So, right now, I have completed day six of the #RWRunStreak. Here’s to 30 more!